Contact us to take advantage of this limited time offer! 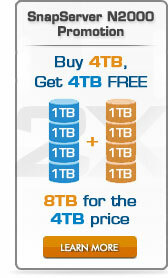 Get 8TB for the Price of 4TB! For a limited time, BackupWorks is doubling your capacity with purchase. Buy a 4TB SnapServer N2000 and we’ll double your capacity for FREE! That's correct, buy a SnapServer N2000 8TB Enterprise rackmount NAS at the price of a 4TB unit. Hurry, this offer only lasts until May 31, 2011. This promotion is our own extension of the manufacturer's promotion that ended March 25, 2011. Due to the overwhelming success of the promotion we are extending said promotion through May 31, 2011. Q: What is the SnapServer N2000 Double Your Capacity FREE Promotion (April 1, 2011 - May 31, 2011)? A: Purchase a SnapServer N2000 4TB Model and Receive a FREE Upgrade to an 8TB Model. A: The Promotion is effective from 12:01am, PST, April 1, 2011 until 11:59pm, PDT, May 31 2011. ALL ORDERS MUST BE PLACED BY May 31, 2011. NO EXCEPTIONS. A: Promo pricing for the 8TB N2000 configurations has already been set by BackupWorks. Customers simply need to purchase an 8TB system or call their BackupWork Rep at 866 801 2944.